You are here: Home / Property / Is London property good investment for Singaporeans? Is London property good investment for Singaporeans? Singaporeans love to put their trust in properties. After 7 rounds of property cooling measures, the local market finally becomes quieter. But Singaporeans won’t stop here and many start to flock overseas to “hunt for bargains”. Are these news headlines familiar to you lately? Is the land in London really greener? Are these overseas property investments better for Singaporeans? Today I will just use London property as an example to decipher this myth. Below is the London property index chart from UK Land Registry website. 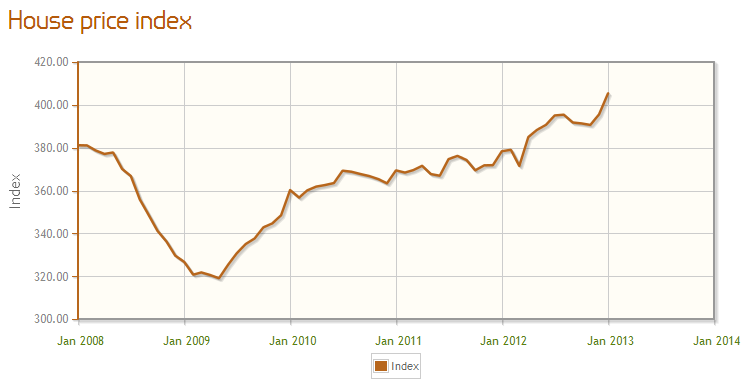 From Jan 2008 to Jan 2013, the property index moved from 381.14 to 405.4. In another word, your London property value increased only 1.2% per year for the past 5 property booming years. 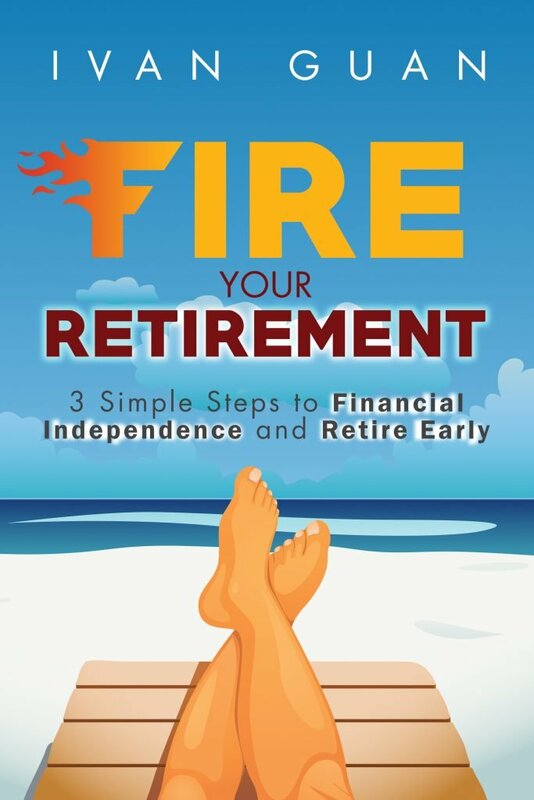 Are you sure you are making a positive cash flow? There is always this marketing gimmick that weak British Pound makes London properties attractive to Singapore investors. In the past 5 years, the currency of your London property, Great British Pound (GBP) has depreciated nearly 35% against Singapore Dollar (SGD). Now think about it. 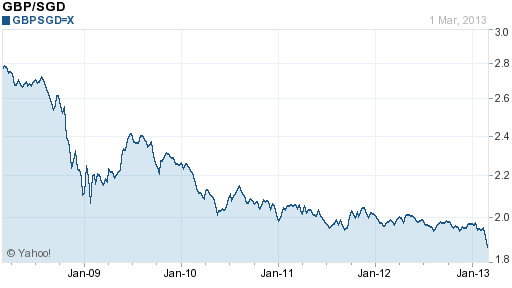 Five years ago, you would have been told that Pound was weak, seize the opportunity! Three years ago, it could have been the same story; Today, with the record low exchange rate, is this opportunity still irresistible? 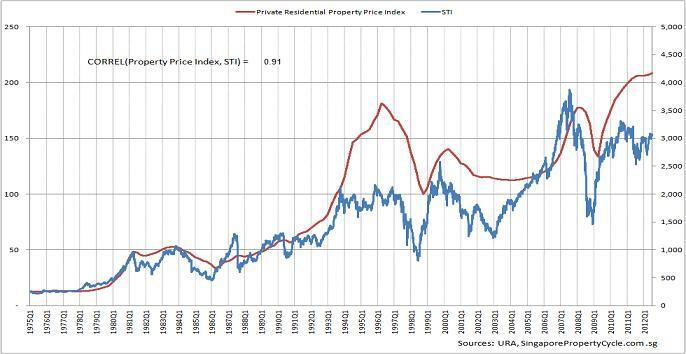 In fact, there has always been a strong correlation (price moves in tandem) between property price and stock market and economy. In addition, the prolonged deprecation of the pound has real economic reasons and everyone should know a cheaper price is not necessarily a bargain. For example, Moody’s Investors Service has recently cut the U.K.’s AAA credit rating, sapping demand for the nation’s currency. Therefore, it has always been puzzling to me when the newspaper features some “investment gurus” whose best investment are their properties while their worse investments are stocks. A private property sitting on London’s land can only earn revenue (rental) from London and valued in sterling. On contrary, most of the FTSE 100 companies derive at least 50% of the profits from overseas. If I have to invest in the UK recovery story now, I’d rather buy their stocks.